Here it is, chickadees, the final post of Black History Month 2016. So far on Masculinity Mondays we've discussed how even progressive shows can reinforce harmful stereotypes, representations of black men in positions of authority that subvert expected narratives, black excellence and white apathy, and the question of why we as a culture insist that nerdiness can't be black. Now we're at the end of this series (though certainly not at the end of talking about representations of black men and people of color in popular culture, definitely not), and it's time to look at perhaps the most culturally relevant example of all. That's right: it's time to talk about Star Wars: The Force Awakens and Finn. As I've previously established on here, I am not personally much of a Star Wars fan. When it comes to the great nerd divides, I've always skewed more towards Lord of the Rings and Star Trek than the hallowed George Lucas films. Heck, even in reviewing this most recent film, I wasn't exactly showering the praise down - I thought the movie had potential but overall was more just a rehash of nostalgia than a promising new story. So you might be forgiven for not taking me seriously when I say that I think Finn is a great character. That's fair. But out of all the things I didn't like in The Force Awakens, Finn was one of the few things I really genuinely loved. And why wouldn't I? Finn is the rare character who is even better than he first appears. A sweet, gentle, kind man who cannot be broken even by years of brainwashing, Finn is the perfect example of the reluctant hero who really just wants to hide under a bed somewhere but saves the world because it's better than living in a world that doesn't get saved. What's really interesting here, though, isn't that I happen to like a Star Wars character or even that Finn is such a precious lamb. The fascinating thing is that Finn is a precious lamb and, to our eyes at least, black. That is a big deal. Now I don't want to get into a big discussion of race in the Star Wars universe. I'm sure that there are quite a few of you out there who have given this more thought than I ever will and I am equally sure that I frankly don't care. I like Lando and I met Billy Dee Williams that one time and quite frankly beyond that I'm just not invested enough in this universe to understand the nuances of race as it pertains to this story. I'm more interested in how race in this story affects race in our world. As far as I can tell, though, race isn't much of a factor in the Star Wars universe. It doesn't seem to be, anyway. While there are bars that discriminate against droids and probably some humanoid vs. non-humanoid sentiments, race among humans doesn't seem to be much of a thing. So in that regard, having Finn (as played by John Boyega) be a visibly identifiable black man really means nothing. Who cares? Maz Kanata is tiny and orange and voiced by Lupita Nyong'o and no one cares, so it clearly doesn't matter. What matters about Finn is how he translates into American culture. See, Finn essentially embodies everything that we as white Americans refuse to believe about young black men. Our culture tends to personify young black men as tough, street-smart, physically imposing, brash, uneducated, mean, rude, and violent. I could keep going, unfortunately. We as white people are great at coming up with reasons why black men are scary and bad and this demonization of black men has led to an increased insensitivity to their deaths. If we tell ourselves over and over again that young black men are violent and cruel, then why should we as white people care when they die? By perpetuating these stereotypes we perpetuate violence against black men and a tolerance for that violence in white culture. You can see this implicit tolerance for violence against black bodies in the way we portray even "good" black men. Lots of smarter people have pointed out that black men are more likely to be nominated for an Oscar - though they still face an uphill battle on that one - if the role they play is that of a civil rights leader or slave facing up against violent oppression. In other words, we tend to reward most the films that show violence being done against black men, particularly violence that is uncalled for. Black men are noble when they are beaten down. When they simply exist in their own frameworks, we in white America find that threatening and distasteful. This violence against black men has become a very literal trope. "The black guy always dies first." It's funny because it's true, but it's also incredibly sad. For a whole host of reasons, frequently the only black character to appear in any given film or show is the one who will most quickly be written out again. Even shows with otherwise "progressive" agendas, like The 100 or Teen Wolf, kill off their black characters at an alarming rate. And it's worth noting, as I said before, that most of the Oscar-nominated movies we see about black men are ones where the men are subject to horrific oppression - Selma and 12 Years a Slave being the two most obvious recent examples*. My point here is that we as a culture have two assumptions about young black men in movies and television: if they are "bad" then they are violent and cruel and deserve their fates, and if they are "good" they will suffer terribly and endure it all with noble silence. That's pretty much it. Hollywood is not kind to young black men, particularly not young, physically fit black men. This brings us back to Finn and why he's such an important character. 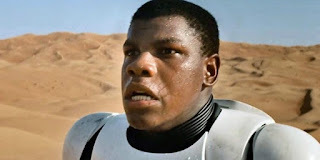 So Finn (John Boyega) is one of the first characters introduced in The Force Awakens. A stormtrooper who suffers a crisis of conscience during his first ever battle, Finn quickly becomes our eyes into the story. What's interesting here is not that he balks at shooting innocent villagers, but rather that he balks at shooting them even though he has been trained his entire life to follow just these kinds of orders. From the very first time we meet Finn, we know that he's special. And that just carries on. Once his consciousness has been raised and he's decided to get the hell out of the First Order, the first thing Finn - at this point still FN-2187 - does is free a Resistance pilot. Now part of this is obviously practical. If you're trying to escape a spaceship then you probably need a pilot. But another part of this is astounding. For all that Finn has been, as we said before, trained since childhood to believe in the First Order, his instinct is to defect immediately upon realizing he cannot stomach violence. 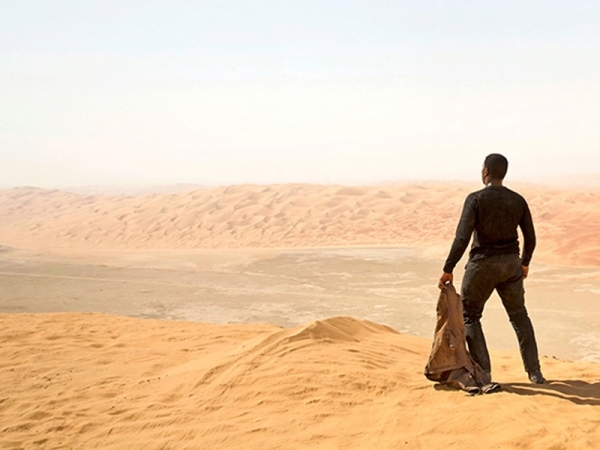 Not only that, but in the very few minutes that he and Poe (Oscar Isaac) are flying through the First Order blockade, they form a bond so tight that Finn openly mourns Poe's supposed death. 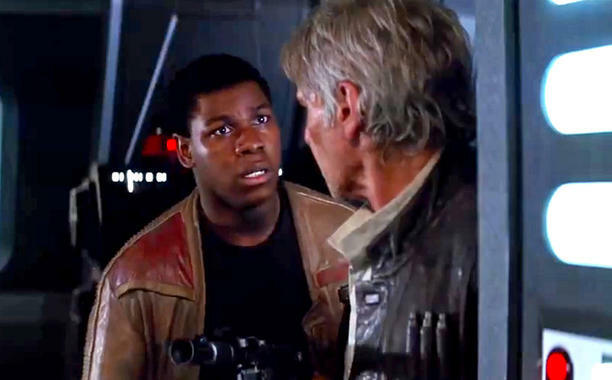 What we've learned about him so far is that Finn, far from being a soulless automaton or even a violent, menacing black man, is sensitive, empathetic, and deeply invested in other people. Already we're going heavily against the usual way young black men are portrayed. The movie only continues in that direction, too. When he meets Rey (Daisy Ridley), Finn's first thought is to run and help her fight off the bad guys. Upon seeing she needs no help, he still sticks with her and gives her the support she needs to escape Jakku. When faced with the possibility that the First Order will catch him again, Finn doesn't go all "well let them try!" and reinforce stereotypes about compulsive violent black masculinity, he tries to run away. Then he comes back because he can't bear the thought of people he loves being in trouble. 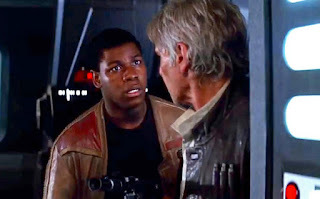 Finn is overjoyed to realize Poe is alive. Finn is devastated that Rey was taken. Finn basically hijacks an entire mission to help his friend. Finn picks up a weapon he has no idea how to use because he has to fight the bad guys. 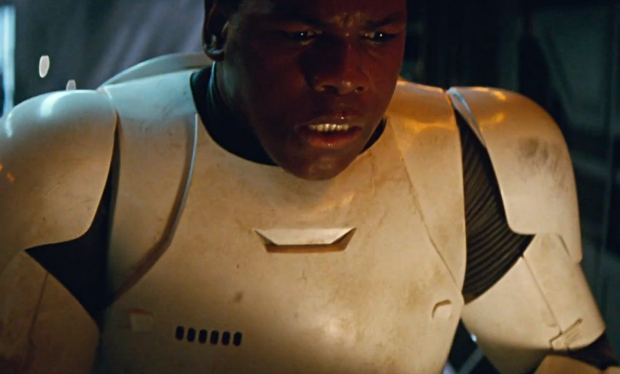 Finn sacrifices himself for his friend but is given honor and respect for doing so. In pretty much every sense I can think of, Finn subverts our expectations of what a young black man should be like in an action movie. He's sweet and sensitive and cowardly and uncomfortable with violence. He'll fight if he has to, but he'd much rather not. He likes nicknames and friends and hugs and cute things. Finn is a precious flower and that's fantastic. He's soft. How often do we see young black men shown as gentle? But possibly most importantly of all, Finn is not condemned to this "acceptable violence" paradigm. When Finn is hurt - and hurt extremely badly - at the end of the film, the violence is not shown to be "okay". He doesn't shake it off and keep fighting. He doesn't power through. Nor is the violence there because he's a black man standing up for civil rights. It's not a punishment and it's also not a sainthood. Finn gets hurt because he's an untrained fighter going up against a violent white man with years of battle experience. He gets hurt because that's what would happen in that moment, and the film treats it as a freaking tragedy. I mean, it's intense how they all react. Poe is devastated, Rey sits by his bedside, and even General Organa (Carrie Fisher) takes time to see him in his coma because she knows how important Finn is. It's rare to see a film treat violence against black men kindly, but it's even rarer for the film to treat it as something that should have never happened in the first place. Violence against Finn is not expected or understood, it's horrific and cruel because Finn is so soft and kind and sweet. Obviously this portrayal of black masculinity as gentleness and kindness and friendship is really important and necessary in our culture. Clearly I am a fan. But I think it's worth pointing out that the real greatness here is that all of this appears in a film that is marketed heavily to children. 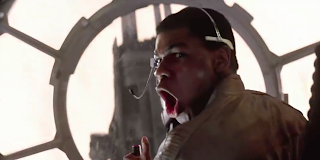 Star Wars: The Force Awakens is not, technically speaking, a kids' movie. But let's be real, a huge portion of the audience for this film and for the entire upcoming trilogy is and will be children. We love showing kids Star Wars and kids love these movies. Even in that sense it's great to just have a black man on screen, since it reinforces the concept that black people exist in science fiction too and it normalizes representations of people of color. 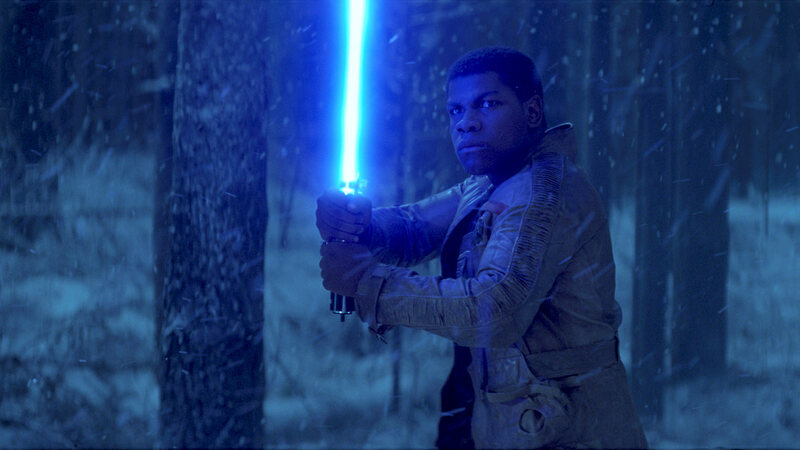 But it's especially awesome to realize that there are millions of children growing up who see Finn and know that this is a valid was for a black man to exist, that Finn's heroism and cowardice and softness are all perfectly reasonable expressions of black masculinity. I'm talking about black children, definitely, who get to see a hero who looks like them, but I'm also really really talking about white children who for once get to see an image of a black man who isn't punished by the narrative. A black man who is everything popular culture usually tells them black men aren't. A black man who is so unfathomably good that even twenty years of brainwashing couldn't make him a killer. Finn is pure in a way that few male characters and almost no black male characters are ever allowed to be. He is sunshine and light and happiness and it's astounding to think about the impact this could have on a whole generation of kids. Kids who see Finn and want to be like him, and kids who see Finn and then see him in the people around them too. A lot of the time my articles can kind of bum people out. I know this, and I am sorry. But this time I want you to be happy with me. I want you to be overjoyed that Finn exists because, well, he does exist! Black men like Finn are real and good and worth celebrating. And black characters like Finn give us a chance to change our cultural conversation on young black men and the violence they endure. I look at Finn and I have hope, and it's a pretty nice feeling. *Both of these are actually excellent films and far more complex than I am making them out to be here. But my point stands. He's sweet and sensitive and cowardly and uncomfortable with violence. I think cowardly is the wrong word. A coward would have massacred the villagers because that was the safer choice (even if he planned to defect later). A coward wouldn't have instinctively run to help Rey. What I think he was was, when it came to the First Order, was overwhelmed - fighting them was something he didn't think was possible - running was the only option, and one he didn't just want for himself. Finn basically hijacks an entire mission to help his friend. And he's still the person to come up with the plan for the mission to succeed, right after Han starts chewing him out. Which means that either he thinks on his feet really well, or he'd spent the trip thinking about how to solve the problem his hijack would cause - either of these things is also not how black men are commonly shown in films. Fair point. I don't know if we have an English word for what I mean though. I mean cowardly in the way that the 9th Doctor called himself a coward, you know? Hmm. Need to figure out the better word for that. I do like the concept that Finn is still the one with the answer, even if he's the one who was flying by the seat of his pants. It would have been a much worse film if he hadn't been the one to come up with that. Thanks probably in part to your presence in his formative years, my 11-year-old son is constantly commenting on how disappointing it is that male characters do not reflect actual men. He may be more skewed toward spiritual-awareness and tenderheartedness than some men, but certainly not ALL men, and so far the offerings of characters for him to identify with are few and far between. Finn was one of the few who was real, admirable, balanced, and identifiable.